These Flourless Peppermint Chocolate Brownies are incredibly chewy, fudgy and full of chocolate and drizzled with white chocolate. They are SO decadent! 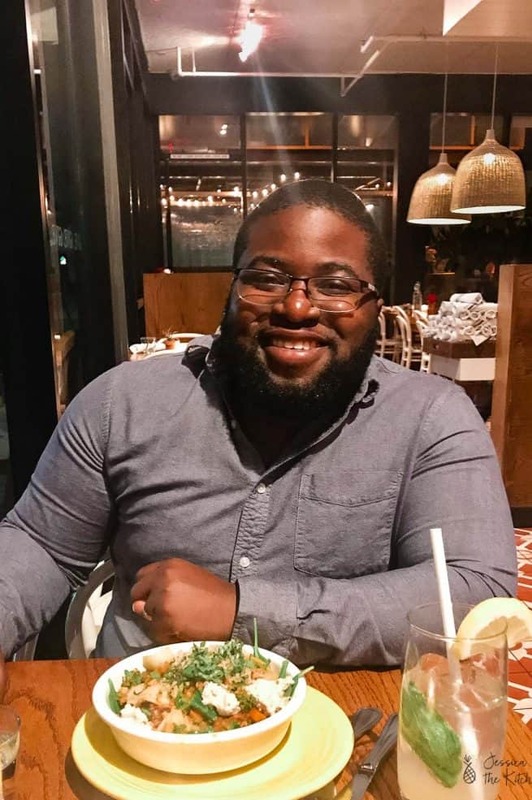 This weekend was one of most exciting ones for me and Jessica in the Kitchen – I won a special award for my contribution to food blogging in Jamaica! I shared photos on my Facebook page so please definitely check those out! Being awarded was such an honour, and reminded me at the core, why I love Jessica in the Kitchen and why I show up every week to post here. What better way to celebrate than with these brownies? When I think of Christmas, I automatically think of PEPPERMINT and CHOCOLATE. Well, I think of chocolate all the time, but it does seem to fit so perfectly in this scenario. This is my most beloved brownie recipe aka the BEST brownies titled by dozens of folks, that I created about 4 years ago and have been using whenever I need to make brownies ever since. They’ve been compared to Ghirardelli Brownies! I can’t make this stuff up. My usual recipe was made with all purpose flour and I wanted to revolutionise it so that you could get flourless brownies and brownies that are still thick, chewy and fudgy all at the same time. Guess what? It happened, and I couldn’t be more pleased with the results. Oats have been a true friend to me on this blog and have helped with removing flour from recipes and replacing them with ground up oats. That’s exactly what I did here – I upped the dry quantity from ¾ cup to 1 cup of oat “flour” since oats absorb liquid so much and ensured to use rolled oats since I still wanted thick brownies. I’m incredibly impressed with the results. The oats worked even better than I thought and you won’t even realise. 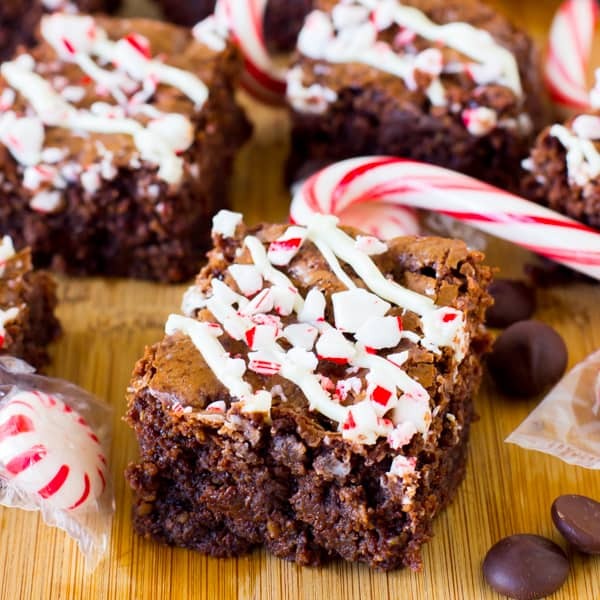 They created beautifully tall thick and chewy peppermint chocolate brownies that were fudgy all at once, while being offset with the Christmas addition of peppermint extract. This is in no way a sponsored post, but I do believe that the best brownies are made with chocolate chips and not cocoa powder, and Ghirardelli chocolate chips/baking chips are the best ones to use. Seriously, I have used every single time and none have produced results like those have. After I took one (okay ten) bites my teeth sunk deep and I was hit by every flavour all at once in the most delightful way. 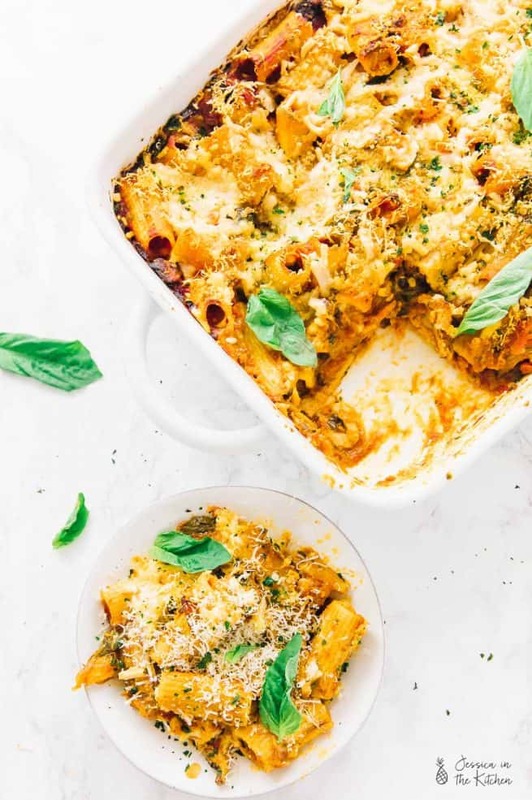 It’s healthier comfort food, but some AMAZING comfort food nonetheless. So, now that we’re done obsessing over the brownie itself, the white chocolate candy cane topping. I knew most recipes have an entirely new layer on top but I really wanted the brownies to shine through without making this dessert too much. I melted some white chocolate mixed with a drop of peppermint extract, drizzled it on top and sprinkled crushed candy canes on top. It seems so simple (and it is) but it creates such a flavour explosion in your mouth that I dare you to make these and only eat one. 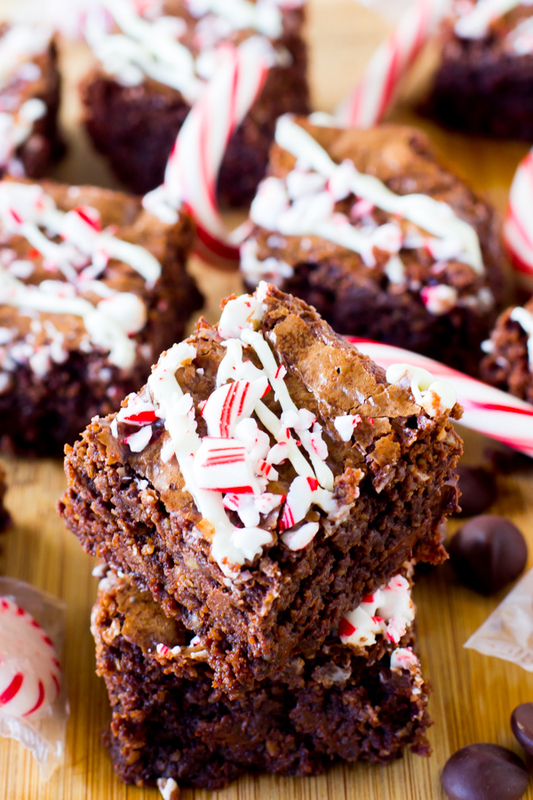 Christmas is so close and these peppermint chocolate brownies need to be made in your kitchen. Whip up two batches so you can gift one, and eat one all by yourself. If you try these Chocolate Peppermint Brownies (Gluten Free) please let me know in the comment section below, or tag me on instagram with the hashtag #jessicainthekitchen! For more exclusive recipes follow me on Instagram AND on Snapchat: jessinkitchen. If you try this Flourless Peppermint Chocolate Brownies please let me know in the comment section below, or tag me on instagram with the hashtag #jessicainthekitchen! For more exclusive recipes follow me on Instagram AND on Snapchat: jessinkitchen. Melt chocolate chips in microwave for a minute, stirring after to see if chips have melted. If not, microwave in increments of 30 seconds until completely melted. In a medium bowl, sift the oat flour, salt and baking soda until combined. Set aside. In a separate bowl, add the eggs, sugar and oil and mix until combined for about 2 minutes. Add the water and the vanilla extract. Add to the dry mixture to the wet mixture and melted chocolate chips and stir for about 3 minutes until combined. Stir in 1 cup chocolate chips and peppermint extract. Pour into a greased, parchment lined, or a greased foil-lined 8x8 square pan. Bake for 35 minutes. After brownies have cooled, drizzle white chocolate mixture over brownies then sprinkle candy canes on top. Melt 1/4 cup white chocolate in the microwave for 30 seconds. Stir in coconut oil and peppermint extract and mix until smooth. Place in a ziplock bag and cut off a corner. When making oat flour, I highly recommend using rolled oats/old fashioned oats unless quick oats is specifically called for. Rolled oats create a thicker texture and more of a bind than quick oats do. Also, you want to ensure your oats are pulsed to a flour consistency so use a high quality blender or food processor. My Ninja pulsed them well but the Nutri Bullet did an excellent job after only a few seconds. Measure the oats AFTER they’ve been pulsed! Congrats on your award, Jessica! 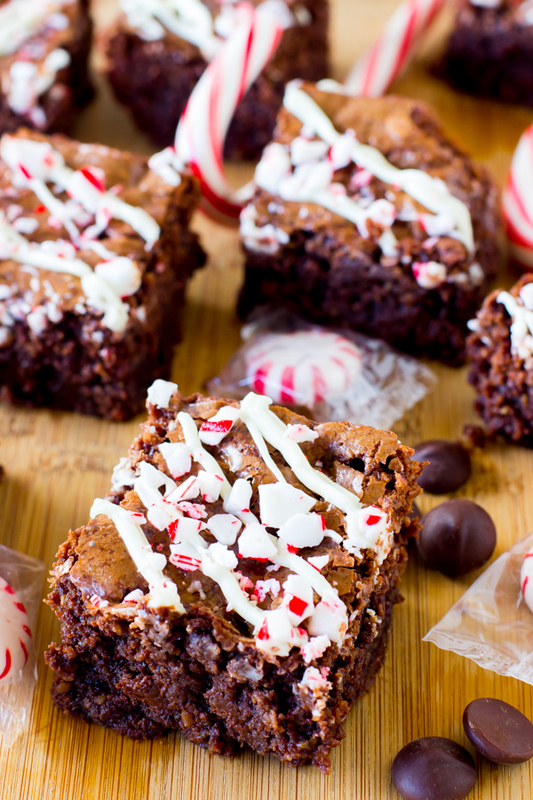 These peppermint brownies look perfect for Christmas! I make a more traditional version for my son that he just loves but I’d love to try yours with the oat flour. Thanks Monica!! My family couldn’t even tell the difference! Congratulations of the award! That’s so great 🙂 These brownies look delicious. 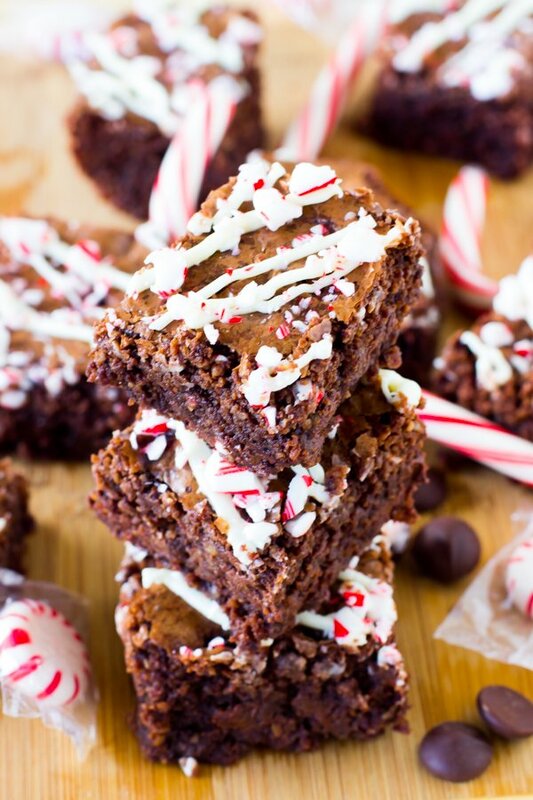 They look so chewy and chocolate-y, and the peppermint topping makes them so Christmas-y! I love flourless chocolate cake and this is a great spin on that. Pinned! These look insane! Cannot have just one! These look yummy and I love how you used coconut oil in the topping. CONGRATS-you totally deserve it. You’re amazing!!! I totally missed this in my inbox.. what’s the deal, self! These look insanely awesome, and I LOVE using oat flour. 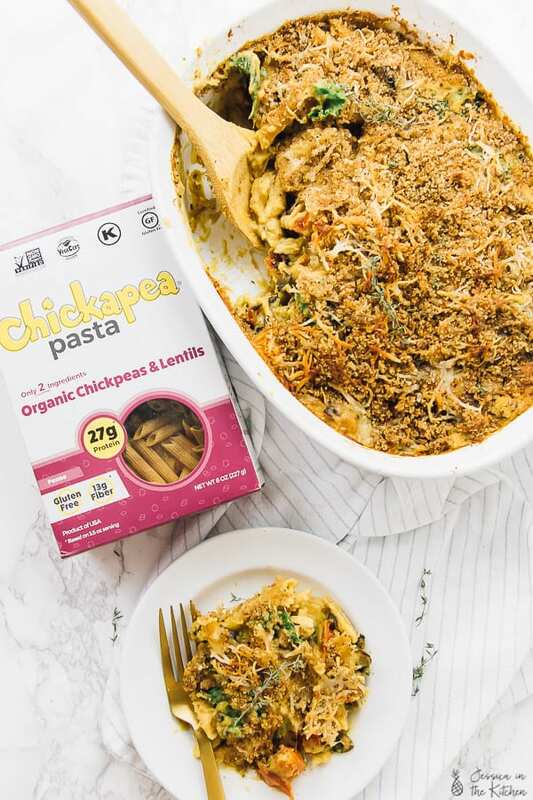 Such a natural, delish replacement. Can’t wait to try these! Congratulations on the award, Jess! You deserve it – this blog is such a beautiful, delicious space and your writing is fantastic. I always love coming here. For example, these gorgeous, insanely fudgy brownies are putting a huge smile on my face (and a rumble in my belly). The oat flour totally did the trick. I don’t think I’ve ever made brownies this tall, chocolatey and gooey before. I need to make these asap. Nancy you are SO kind!! Thanks you so much girl <3. It really means a lot to me. Jessica, these look amazing! Can’t believe they’re sort semi healthy-ish 🙂 Love the oats and oat flour. The kids would love all that peppermint candy for sure. Thanks for sharing. Thanks so much Amy and you’re welcome! i love that they are made with oats. these look amazing! Huge congrats on the award Jessica!! How awesome! And these brownies … man, they look delicious. Especially with that peppermint!! Awwww how adorable are those brownies and love the fact that they are flourless too. Genius Jessica! I can’t imagine how rich and decadent a flourless brownie is. These look fabulous. I’m going crazy between the skinny pasta, the bark and now the brownies. Everything looks delicious! 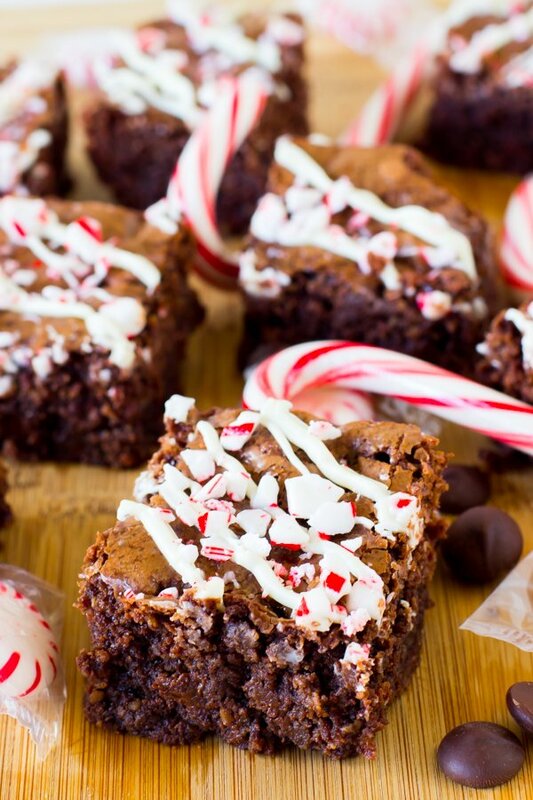 I’m so in the mood for peppermint brownies so these sound great, but before I make this…is the coconut oil melted? In your other brownie recipes, the coconut oil is pre-melted. Thanks. Thanks! Yes it is melted :). Enjoy!